Hiring a professional adds value to your home. Doing it yourself risks devaluing your home. If you are trying to build a credit score from a damaged profile, one of the best ways to establish and show credit responsibility is to use a secured credit card to do so. Good credit card companies will report payment history to the three major credit repositories which will help to raise credit scores if you use the card instead of a debit card or cash, pay the balance down to 0 each period (just as you would with cash), elect to raise credit limits over time, but continue to maintain a 0 balance that goes beyond 30 days. This will result in having open credit funds available at all time, but not being used which helps credit scores. Bankrate has done a great job of showing who some of the best of the best secured credit cards are. Follow the link to find the one that's right for you. How much should you spend on a kitchen remodeling project? Many kitchen remodeling experts use a rule of thumb of 10% - 20% of a home's current market value as the budget limits to kitchen remodeling. The thought process is that if a homeowner spends too much on the project, they will not recover their investment when they sell their property. 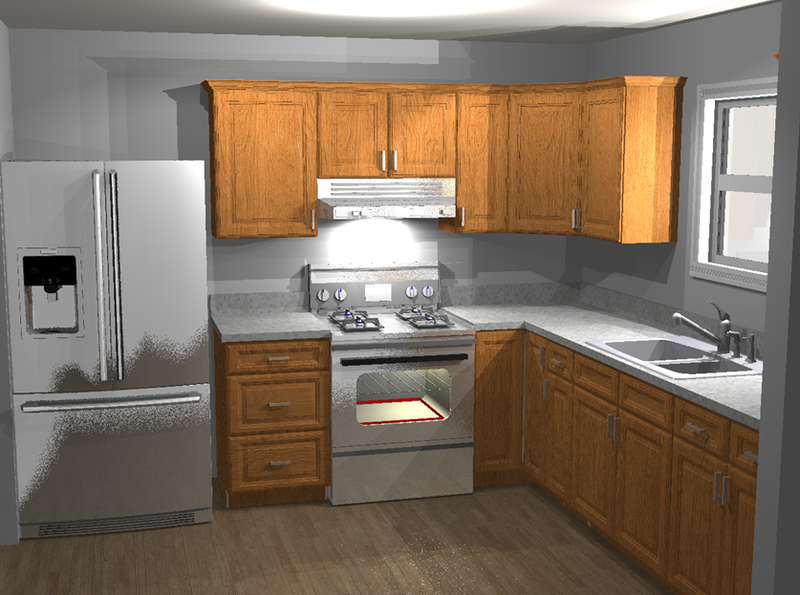 The same rule of thumb also implies that if the homeowner spends too little on a kitchen remodeling project by doing partial remodeling projects in the kitchen (one piece at a time), they risk devaluing their property and wasting money as those pieces will wear and be replaced when other parts are done or the budget is available to do the entire kitchen. Experts often advise homeowners to budget for the best possible material that will fit their current budget, and if not enough to do it right, then wait until funds are available or finance a remodel using the home's available equity with a new property appraisal using the proposed project as a tool to improve the home's value. Homeowners should carefully consider the quality of materials installed to replace cheaper standard grade construction when budgeting for a kitchen remodel. It pays dividends to select better grade materials installed by authorized manufacturer's representatives or factory installers where a substantial warranty on materials and workmanship will exceed two years. Aristokraft cabinets is a good example of a Master Brand cabinet maker that stands apart with high quality construction of cabinets. Aristokraft is recommended by Good Housekeeping Magazine which also provides a two year warranty on factory authorized installed products. Aristokraft itself offers a 10 year warranty on their cabinets with a lifetime warranty on moving parts such as hinges, drawer glides, handles and pulls which wear out over time. Qualified remodeling professionals who do good work and have proven their capabilities and maturity in the industry often have multiple local lenders vying to work with their customers in connection with financing kitchen remodeling projects to provide competitive financing options for homeowners. Getting approved for a home improvement project may be easier than qualifying for other types of financing because the remodeler's business relationship and credit worthiness is a factor with small lenders in the consumer credit approval process. Lenders are more likely to approve an applicant's loan with credit challenges if the remodeler's reputation, endorsement of the project or guarantee to help the homeowner repay the loan is part of the application or underwriting process. Consequently qualified professionals with substantial assets, reputation and lender connections can make it easier for homeowners with lower FICO scores get projects approved at competitive APRs, with little up front investment and simple interest loans offering no prepayment penalty to pay off the financed amount early. In addition, these types of project loans can help homeowners re-establish and restore good credit history with the credit bureaus with timely repayments or early payoff. Improving an outdated kitchen generally leads to a faster sale or rental of a residential property and higher sale price relative to comparable homes. Conversely homes that have outdated kitchens tend to be penalized in valuation by 7% to 12% of a home's comparable market value which sets a realistic kitchen remodeling budget for homeowners. To check your home's market value, sources such as Zillow and property tax records are helpful to determine a kitchen remodeling budget. Another helpful source is the Cost Vs Value site from Hanley Wood. Remodeling and Insurance professionals can offer a wealth of information on project costs and often know trusted real estate and mortgage professionals. What's a better investment? A mid-range bath remodel or stocks? 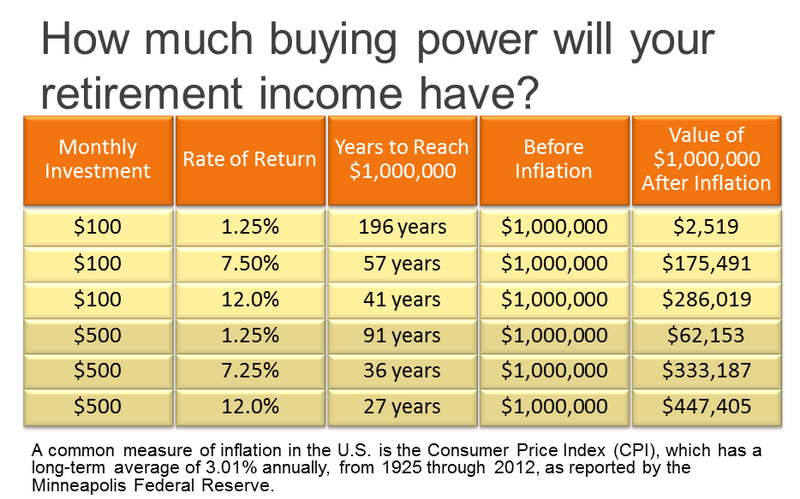 In this review of where people might invest their money, I'm not considering tax advantages of the investment strategy. But the data sets below gleaned from data published by Qualified Remodeling Magazine have been repeatedly reported by other published sources including CNN Money, Kiplinger, Wall Street Journal, Consumer Reports and many others who cite the source for published industry data used by companies and inspectors in the home remodeling and building industry to estimate a mid-range bathroom remodel project (defined as a 5'x7' standard size bathroom including 4x4 ceramic tile floor, new one piece sink bowl and top, new standard toilet, new 30"x60" standard porcelain on steel tub, new tub wall surround with 4x4 ceramic tiles, positive temperature pressure balancing valve and shower head for the tub, ceiling light and paint on walls) at around $16,000 in South Atlantic Region around Washington, DC, Maryland and Northern Virginia where I reside. My money would be on the bathroom remodel if it needs to be done. The reason is because this exact same project 12 years ago only cost around $10,000, and the price has only gone up since then. As home values rise again it is only going to go up even more from here. I would only invest in good quality materials that will last a lifetime installed by good qualified contractors with an established track record. Materials such as the closed cell non-porous Sentrel Bath System synthetic stone material which has the appearance and characteristics of natural stone without the need for any maintenance and comes with a lifetime warranty is where I would likely invest my money. I might also consider investing in an acrylic bath and wall system that does not require any maintenance and comes with the Good Housekeeping seal of approval if I could accept the look of shiny plastic veneers on my bath walls at more or less the same cost as the synthetic stone material. I might also invest in good quality tile craftsman that specialize in setting tiles who build beautiful mosaic patterns with porcelain, glass, natural stone and ceramics for a little more money. I base it on the reasoning that if I plan on selling the home, I am going to recover almost 99 cents on every dollar invested in the remodel project based on industry data in my Washington, DC region. Over time, I can actually see the value APPRECIATE for a gain if the work done lasts and looks good 12 years later and is covered by manufacturer's warranty! 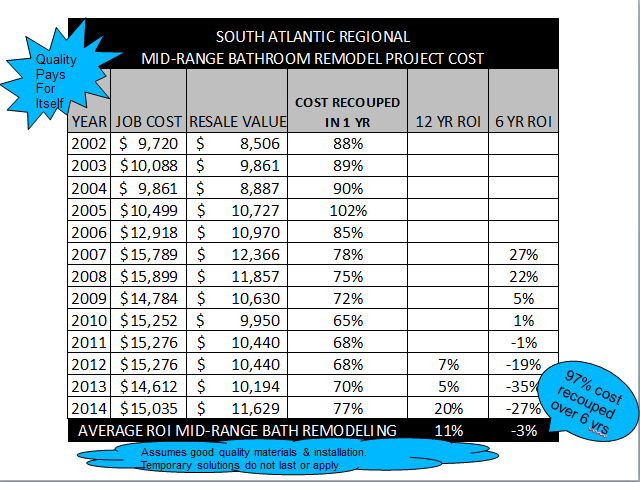 It is interesting to note that during the greatest recession in our country's history since the Great Depression, the cost of bathroom remodeling actually went up or stayed the same rather than going down, while stocks lost value by almost half over that same 6 yr period measured. 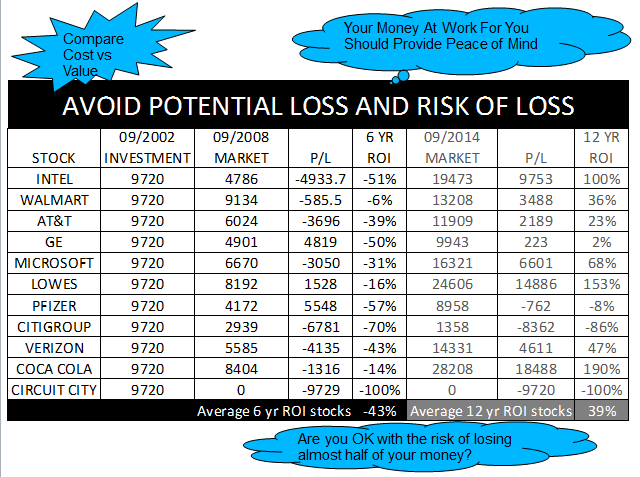 Over time the same stock picks recovered and returned almost 40% over a 12 year period, so there is great gains to be had in stocks vs the more modest return on investment of only around 11% gain or appreciation on the investment in the bathroom remodeling project. However, the bath remodel project didn't really have any risk associated with it in the short term. So if getting a value with less risk is something that matters to you and makes you feel better in terms of maintaining your living space, I'd recommend the bathroom investment. If you don't want to see the value of your investment dollar risked on something that could lose value by almost half, then the safer bet is in the bathroom remodel project. To find a qualified remodeler in the Washington, DC area that can install any material you want and build a bathroom for your to your exact specifications and is licensed, bonded and has an A+ rating with the DC, MD, VA region's Better Business Bureau, visit http://dmvlifequote.com/homeremodeling.html for more information. The Affordable Care Act tax credits may provide the incentive needed to turn more Americans into "job creators"
Despite the 3 panel judge ruling this week that the tax credits in states relying on the Federally-facilitated Marketplace will not be allowed, the full panel of judges or supreme court will rule that they are allowed and Americans will still begin choosing their qualified health plans on the Federally-facilitated Marketplace and their state facilitated marketplace in earnest between Nov 15 and Feb 15 (all individuals and small businesses who are not covered by another qualified health plan will select a plan through these marketplaces going forward), they will find that they like what they see. Lowered costs for coverage and tax credits as incentives for both individuals and small businesses! In some cases the individuals who qualify because they fall within 138% of the Federal Poverty Level in the chart above, they maybe eligible for tax credits of as much as $800/mo that can either be applied directly toward their health insurance premium, or taken as a tax credit on their tax returns when they file. Small businesses with under 25 employees and at least 70% of eligible employees participating in their group will also be eligible for tax credits up to 80% of the costs for providing qualified health plans through the marketplace to employees. They only need to have one employee to qualify! See a knowledgeable tax advisor or insurance broker for more information on this subject (this post and the author is not providing tax advice, and the examples cited is hypothetical based on current guidelines). The root cause of almost half of US bankruptcies being due to medical expenses is far less likely to occur going forward. It is also not going to be a contributing factor to poor credit scores any longer. The most cited reason given by individuals surveyed with credit scores lower than 600 was lack of stable or enough income to service the household debt and living expenses of the household. Health issues of primary wage earners or family members was a causal driver to job absenteeism which led to loss of income from wage or business proprietorships. That problem is solved with the Affordable Care Act, and once Americans understand and get used to the law, they are going to thank this administration for implementing the law. Even Republicans and Tea Party members will look back and realize they were on the wrong side of the issue when the economy is booming with job creators. The 2014 and 2015 tax credits triggered by the Affordable Care Act may actually inject a much needed stimulus into the middle class to shake the US economy loose of the economic malaise from stagnant wage growth in the middle class. That has led to weak consumer demand on goods and services typically picked up by middle class consumers (such as specialty retailers and casual dining which have been particularly hit hard). Only time will tell. Affordable Care Act marketplaces will require everyone to choose a qualified health plan unless one works for a large multi-state employer, or the government, or is covered by a spouse's or parent's plan or eligible in a government health plan like Tricare, VA, Medicare or Medicaid. The country may soon find it is being transformed into a country of "job creators" starting with the low wage individuals creating the first jobs for themselves. For the first time in a long time, low wage earning Americans will be incentivized with these tax credits to quit accepting low wage jobs and compete openly to service customers or deliver products and goods directly as self employed agents and entrepreneurs. The cost of affordable health care as a benefit provided by large employers is off the table as an excuse as to why individuals can't quit and follow their dreams to do better than work in a low wage job for a large employer. The remaining hurdles for individuals will be availability of credit from suppliers, access to capital to either educate themselves with a particular set of skills to service customers or actually deliver products and services on time and as promised. Access to investors, banks and suppliers will be more important than ever, and individual credit scores will play a major role in the cost of money for entrepreneurs. It may be time to start talking to credit repair service providers who specialize in credit repair (attorneys are a great source of information). The process can take a year to go from a 500+ FICO score to an 800+ FICO score, but the rewards will transform lives of individuals for the better, which will in turn help the country become a booming economic engine with manufacturing, skilled labor and very low unemployment. There are specialists who can educate individuals on business models with a business model canvas, successful franchise systems for sale, business brokers selling main street businesses, management consultants with MBAs ready to step in and guide owners, skilled trades training programs at community colleges, certification courses for in-demand skills in IT, healthcare and software, computer language training academies, free courses at MIT, Coursera, and our public school systems. This leaves no excuse for Americans to not get healthy (physically and with skills) and to no longer accept low wages from employers. You can find mentors willing to help by taking the first step and share information. Visit www.rajdwivedi.com/enroll.html to protect your family in the US or Canada from this happening to you or anyone you know.